If you are concerned your child may be spending too much time online or playing games, or you don't want him/her to use your PC when you're either asleep or away from home, this type of software named Vista User Time Manager offers a solution. It allows you to set limits on how much time your child spends on the computer or online. Vista User Time Manager lets you specify when exactly and how long the computer can be used and define users which will be allowed to use the computer without any limits. You can schedule time intervals and the number of hours each child can use the computer per day a week. It automatically logs your child out of their computer when it's time for lights out. Also you can prevent the PC usage until the specified date, after the specified date or between specified dates. 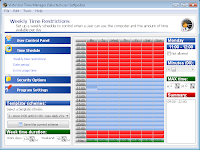 Vista User Time Manager can record all actions to a log file so you will know when and how much your child used the PC. The password control prevents unauthorized users to change settings and uninstall the product, the internal file guard system protects all important files so the program can not be deleted by unwanted person. The multiuser and multilanguages intuitive interface will help you manage this software easy and with pleasure. Acctualy, i used this software when i'm in second semester, now i'm in fourth semester, this software working looks like this software.